A quick perusal of this list leaves one incredulous. How on earth can the sense of these words have been corrupted to such an extent without people noticing? However, even basic research based on the Reading alone proves that the meanings of the words listed above have been deliberately distorted, misconstrued and falsified by the religionists with the intention of subjugating the deen to their lust for personal benefit and power; quite against the specific wishes of God and His messenger. A simple examination of associated meanings, which appear repeatedly in the Reading, should provide enough incentive for the true believer or scholar to undertake an examination of the Reading on the basis of personal and unbiased study, regardless of prevailing consensus. After all, the Reading is (to borrow the computer terminology of our day) the default document of the Muslim faith. The fact is that the religionists have abused four key verses from the Reading to establish their claims. Having made these changes, the knock-on effect requires them to re-interpret other verses and words to retain the appearance of consistency. The end product is a reading of the Reading of God, which has become man-made corruption riddled with inconsistencies and fallacies. Clearly, the end result of such an onslaught has proven disastrous. Evidence of this is painfully apparent in verses: (2:124-1291; 5:1-5; 3:95-97; 9:17-20). I invite the reader to accompany me on a journey of discovery to expose the conspiracy, using the Reading alone as a base of reference. As we go we should remember that the Reading is the only sure-fire revealed testament of God’s will on earth accepted by all Muslims. The Reading is consistent and there is no contradiction in the book. The Reading is the best Hadith or message and it is consistent. The word Hadith is found in the following verses. The criterion of this study is to find the meanings of each word found to be inerrant with other passages by using the Quran alone. In other words, contrictory meanings from other sources besides the Quran are discounted. There is no priesthood or religious clergy in Islam. Thus the interpretations by scholars or priests are also avoided. No human can claim to be the sole authority of the Reading. Only God can explain the Reading since He wrote it. The Reading explains itself and provides the best interpretation, beyond that of any human. Since the study is based solely from the Quran, critics are welcomed to put forward their arguments by applying the same principle. There is no ambiguity to be found in the Reading. The majority of Muslims will be afraid to read what is written in this book because they think they are already on the right path – in the ‘religion of Islam‘ – a belief they have inherited from their forefathers who were effectively shackled by the Arab religious masters. This book encourages them to think, to reason, and to question in the way of the Reading. Reflect on the purpose of life and see the wonders of it – but Muslims are disassembled and they are being dismantled bit by bit right before their eyes. It is being done either by those who would seek to do them ill, or by those who would seek to protect them from those who seek to do them ill. This study threatens the position of all Islamic scholars and cult leaders who promote rock worship, paganism, extremism, and terrorism in the name of God. I invite them to prove me wrong on the basis of the Qur’an alone. Crying aloud of Aidid Safar’s errors or making accusation that he created new meaning to the Qur’an without proving it from the Book itself is useless. That is the patriarchal behaviour of ignorant mullahs who think they can fool the people. Read the above verse again and think. It won’t cost you a penny to think. 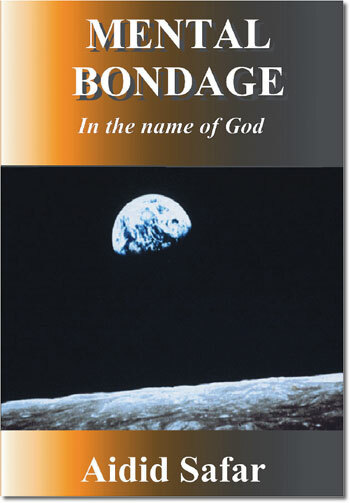 Therefore, read this book with an open mind – and think carefully. You are not alone – other religionists and their scholars have in like manner enslaved the minds of innocent people who follow them blindly including the Christians, Jews, Hindus, Buddhist, Sikhs, Zoroastrians, Bahais, or any other organised religions. 1 Eight words were distorted in 2:125 alone by the religionists to accommodate the rituals at the spot where the Arab god apparently lives. A recurring argument which I have noticed to be in use almost exclusively by individuals of the Quran Alone movement – which it must be noted is a relatively modern argument – is the argument of words signifying significations other than those which they have acquired through linguistic use over the course of many centuries. I reject the validity of this argument, outright, based on the following two arguments. 1. The first argument can be summed up by the mantra oft-quoted by scholars of semantics, and that is: “Meaning is use.” There can be no other way for a word to acquire a meaning other than by way of its being employed in speech or writing. Thus, the signification of a word can be known through only one of two ways. The first is that an individual must have heard that word being used in speech enough times to the effect that he can form a sound idea of how that word is used, and therefore, what it signifies. The second is that an individual can compile a corpus with enough entries of that word to the effect that he can form a sound idea of how that word is used, and therefore, what it signifies. Now, I accept the possibility that some Quranic words are used in ways which confer to them variations of presently existing meanings, or they can introduce new meanings altogether. However, such words must, I emphasise, must be used enough times to allow for that possibility. And if this is not the case, then the only significations with which we can use to understand the text of the Quran are those which the Arabic language itself admits. Thus it is my opinion that verbs and nouns which have only been used 2 or 3 times in the Quran, like zanaa, saraqa, khamr, and maysir, can only mean to fornicate, to steal, wine (or intoxicant), and games of chance, respectively, without modulation of the presently existing meaning. Furthermore, even if a word has been used enough times by the Author in such ways so as to modulate their signification, this is no way invalidates the use of significations which were already in use at the time of the Quran’s revelation. Thus, verbs and nouns like “salaah”, “islaam”, “sujood”, and “sallaa”, can be understood to mean “prayer”, “submission”, “prostation” and “to pray” – such an understanding cannot be invalidated, for such does the tongue entail. 2. The second argument is that if the first argument does not hold true, then there can be no way of knowing which signification the Author intended in the use of any given word, hence, chaos, hence, no guidance, hence, eternal loss. Well if you’re going to accept their authority, I think it would be prudent to do so. I also test the concepts of living speakers, hence discovering the vast differences even between Arabic language scholars. The point is NOT veracity but AUTHORITY. If I find a meaning ineffective, I wouldn’t care himself told me about it. The point is that I must make it effective in MY life. The Arabic language was corrupted to hoodwink more than a billion people. It must be the greatest scam on earth and should go into he Guinness Book of Records. Equally amazing is that more than a billion followers of Islam do not even speak the Arabi language and they follow blindly what the con men dished out to them. This calls for scholarly research on human nature, gullibility and scams. How to fool more than a billion people!